The American Youth Harp Ensemble continues to captivate the audiences around the world as America’s premiere youth harp ensemble, well known for their musical sophistication, rich sound, emotional power, and imaginative programming of repertoire. 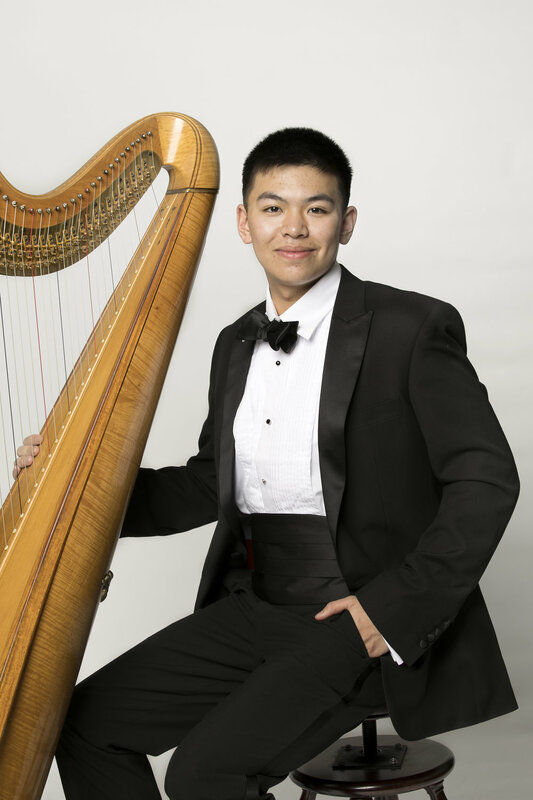 The American Youth Harp Ensemble (AYHE) has brought world-class music to enthusiastic audiences in the U.S. and abroad through hundreds of performances, recordings, television and radio features on CNN, NBC, PBS and NPR affiliate stations. With 25 national and international tours to their credit since 1999, the AYHE made its international debut performing in the Maastricht Music Festival (Netherlands). In 2001, 2007, 2012 and 2016 the AYHE sold out Carnegie Hall and in 2013 the AYHE sold out Alice Tully Hall, Lincoln Center, New York, two of the most celebrated concert halls in the nation. It has had other notable performances at the Edinburgh Easter Festival (Scotland), the Paris Music Festival (France), Salla Puccini (Milan), Salle Gaveau (Paris), St. John’s Smith Square (London), St. George’s Chapel (London), the United Nations (NY), the Kennedy Center (Washington, D.C.), the 34th and 38th American Harp Society National Conferences, and the Association for Music Personnel in Public Radio National Conference (the AYHE was showcased for music directors from National Public Radio affiliate stations across the US and have subsequently been broadcast nationally). The Ensemble has performed twice in the London Festival of Music (England), five times on the “State of the Arts” Concert Series at the U.S. Department of State, six times at the White House (DC), Advent Music Festival in Vienna and Salzburg (Austria), in feature concert in the Concert Hall of the Kennedy Center, as the opening concert for the American Harp Society National Summer Harp Institute, for the King and Queen of Belgium, for the 34th Annual Kennedy Center Honors performing for such musical luminaries John Williams, Itzhak Perlman, Yo Yo Ma, and Jessye Norman, two tours to Austria and the Czech Republic and at the World Harp Congress in Sydney, Australia. In 2016, they toured and performed in Boston, Vermont and renowned Canadian venues including the Basilica de Notre Dame in Montreal and Quebec City. In 2017, the ensemble concertized on tour in Belgium, the Netherlands, Norway, in the Oslo City Hall (the location of the Nobel Peace Prize ceremony) and in London and Wales in addition to over 150 performances in the US. Performances annually reach an estimated audience of more than one million viewers and listeners through media (television and radio) broadcasts and live performances. The AYHE has been featured in two television specials: The American Youth Harp Ensemble: Defying the Limits and The Community Idea Stations Present: Christmas with the American Youth Harp Ensemble both providing extraordinary exposure for the harp and for AYHE programs. The ensemble’s most recent CD entitled Caravan: 10 Harps, 10,000 Miles was considered for a 2016 Grammy award. Most recently the AYHE was honored with a 2016 Dominion ArtStars Award for the state of Virginia. In addition to five performance ensembles, the American Youth Harp Ensemble serves as a national model for arts education. Through year round and summer outreach programs, the AYHE uses the harp as a catalyst for positive change, personal growth and community service for over 800 elementary and secondary students annually, regardless of financial means. The Sound Experiences program offers multi-day per week, tuition-free harp instruction to rural and inner-city underserved youth in Richmond and the surrounding area. The Harp Therapy Outreach Program, in partnership with the Resources for Independent Living Center (a transitioning facility for youth with disabilities) provides harp therapy to physically, emotionally, or behaviorally-challenged youth in a highly structured yet supportive environment. The AYHE Mentorship Program is an adjunct to the above outreach programs. More proficient young harpists in the American Youth Harp Ensemble commit to helping their peers as assistant teachers of the harp, serving as role models and sharing of themselves. Through Community Service programs harp ensemble members also volunteer performances through Young at Harp, a program in which AYHE harpists perform concerts at local retirement communities on a regular basis, and Harping in the Hospitals, a program in collaboration with health-care facilities and hospitals in Central Virginia. Utilizing evaluation tools developed in partnership with clinical staff, Harping in the Hospitals conducts clinical studies to measure the impact of harp music on patients which provides data for ongoing studies. The AYHE Ambassadors Program is a community service program through which students perform over 100 concerts annually to populations with the greatest need including the ill and their families and those with limited access such as the elderly and underserved communities. Service hours are recognized by Presidential Volunteer Service Awards. Young harpists from across the globe come to study during the summer at the Summer Harp Institutes. Purchase American Youth Harp Ensemble recordings here. Our Troubadour Ensemble is for our youngest harpists who wish to enrich their musical learning with an ensemble experience and start gaining the skills early that are needed to participate in the more advanced ensembles. Troubadour Ensemble allows students (even though new to harp) to develop the musicianship skills, hone ensemble playing, and grow through performance opportunities. Audition Details: The Troubadour Ensemble has no audition requirements and students new to the harp are welcome. It is, however, required for students in the Troubadour Ensemble to be taking private lessons with a harp teacher for reinforcement of skills learned during rehearsal. The Lyra Ensemble is a developmental group of students who will progress as they and their musical and instrumental skills mature. It allows newer, less experienced students to begin learning from the experience of preparing for and performing concerts, while still allowing the Intermezzo, Concert and Touring Ensembles to perform more challenging music in more challenging settings. It is our hope that, in time, each Lyra Ensemble member will graduate to the Intermezzo, then Concert, and then on to the Touring Ensemble, providing a consistent progression of challenges and learning experiences for our students. Audition Details: The Lyra Ensemble has no audition requirements and students new to the harp are welcome. It is, however, required for students in the Lyra Ensemble to be taking private lessons with a harp teacher for reinforcement of skills learned during rehearsal. The Intermezzo Ensemble has enabled us to meet the growing demand from advancing students. The Intermezzo Ensemble, like Touring and Concert Ensemble, is a stand alone ensemble that has its own feature performances. Students in this ensemble will be given the opportunity to audition for participation in tours, focusing on a just a few music selections and perfecting those to the required standards for a feature concert. Audition Details: Membership in the Intermezzo Ensemble is by audition only. Attendance at rehearsal on two days a week is required for participation. Private instruction, for an additional fee, is offered on a continuing basis for all members of the Ensembles. Students will also be expected to participate in several concerts per year. The Concert Ensemble is one of only a handful of youth performing groups of its kind in the United States. No other instrumental program in the state is comparably recognized for the high quality of its instruction and performances. The Concert Ensemble defies the limits of the harp. Younger students advance into this group by auditioning and, often, by having performed successfully with the Lyra and Intermezzo Ensembles. The Concert Ensemble has a full schedule of performances on the national level and throughout the Richmond Metro and Central Virginia region. Audition Details: Membership in the Concert Ensemble is by audition only. Attendance at rehearsal on two days a week is required for participation. Private instruction, for an additional fee, is offered on a continuing basis for all members of the Ensembles. Students will also be expected to participate in several concerts per year. The smaller 12-member Touring Ensemble is the elite traveling ensemble. With opportunities to tour regionally, nationally and internationally, these professional level students have astonished audiences around the world. An auditioned group of our most advanced students who are willing to commit to a rigorous rehearsal and performance schedule form the Touring Ensemble. This professional-caliber chamber ensemble of twelve harpists enables the organization to fulfill the numerous requests for state-wide, national, and international performances in prestigious venues while providing a professional level experience for our most accomplished young musicians. Audition Details: Membership in the Touring Ensemble is by audition only. Attendance at rehearsal two days a week is required for participation. Private instruction, for an additional fee, is offered on a continuing basis for all members of the Ensembles. Students will also be expected to participate in several concerts per year.